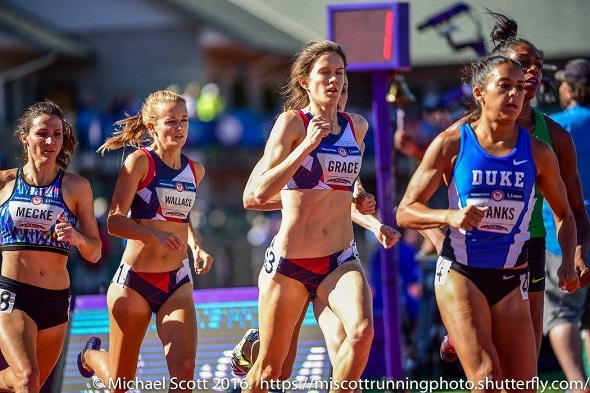 Kate Grace (Yale ’11) has had a dual focus these last few months on the track, as she has improved in both the 800m and 1,500m throughout this spring season. She hit the Olympic standard in both events – a great thing considering how she lost all of last year due to a foot injury. But for the Olympic Trials, did she want to focus on one event or both? And if only one event, then which one? Grace’s gut said the 800m. Her coach didn’t question it as she was one of the favorites in that event to make the team. Grace made it through the rounds with ease and got assigned lane 5 in the final. Once the race started, Grace got out and was among the back of the field as she sat in sixth at the bell. She was able to catch up with the front pack with 200m to go. This pack of six was tight that with 150m to go, so tight that one athlete stumbled and caused a second athlete to fall to the track right in front of Grace. But this was fortuitous for the Yale alumna as it provided her an opening to move to the front and pass Ajee Wilson on her outside shoulder going into the top of the final stretch. Using her 1,500m strength and strong finishing speed, Grace was able to power away from the field and focus on that finishing line, winning her first ever national championship in 1:59.10 and making the Olympic Team. Once the race was over, the reality of the moment began to sink in. “It’s real, it’s real right now. I’ve never podiumed in a national event, in high school or in college or in the pros. I’ve been doing this for so long and I knew this was coming. and I have so many people that I love and it was because of them that I was able to do this for so long. I’m in shock right now” she shared with NBC’s Dwight Stone after the race. That gut is a good thing. And now, onto Rio for Grace and Furey as the Trials will take Tuesday off. Action will resume on Wednesday. This entry was posted on Monday, July 4th, 2016 at 8:31 pm. It is filed under Olympics, Spotlight. You can follow any responses to this entry through the RSS 2.0 feed.